Syrians walk toward Turkish border at the Bab al-Salam crossing, Syria, Feb. 5, 2016. As forces loyal to Syrian President Bashar al-Assad pressed home an offensive in the country's northern Aleppo countryside, tens of thousands of desperate civilians headed to the border with Turkey, swelling the thousands already camped there. "People are dying on the border and nobody cares about them," said Mohammad Ali, a student from the town of Al-Bab who is studying in southern Turkey and has been trying to get family members across. "In this cold, people are desperate, and the Turkish authorities are not allowing anyone to enter illegally. There are snipers everywhere." A young girl from the Al-Bab area was killed Thursday when Turkish border guards opened fire on refugees trying to sneak into Turkey, according to the Syrian Observatory for Human Rights, a London-based monitoring group that receives reports from activists on the ground. The surge of civilians heading to the border started when heavy fighting erupted to the northwest and north of the city of Aleppo, Turkish officials and activists said. The numbers have increased dramatically as Russian airstrikes pound villages, backing one of the biggest regime offensives in the area in the past three years. Rebel commanders have confirmed to VOA that the regime has severed the main rebel supply route to insurgent-held districts in Aleppo, Syria's one-time commercial capital and most populous city. "They are isolated," said Abu Muhammed, an insurgent fighter. Turkish Prime Minister Ahmet Davutoglu estimated as many as 70,000 civilians may be heading to the border, while the Syrian Observatory put the number at about 40,000. Rebels say more than 500 Russian airstrikes since Monday have helped regime troops alongside Shi'ite militiamen from Lebanon's Hezbollah movement and Afghanistan, as well as Iranian Revolutionary Guards, to execute the offensive around Aleppo. Insurgents still control a narrow corridor west of the city they can use for small groups of fighters to enter and exit, but it cannot be used to ferry in large amounts of supplies. 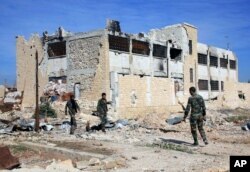 Checkpoints along it are being monitored by al-Qaida's affiliate in Syria, Jabhat al-Nusra, rebel commanders said. The Assad regime's offensive — the most significant since Russia started its military intervention in Syria in September — overshadowed an international donor conference for Syria this past week in London, where $10 billion was pledged in aid for Syrian refugees. 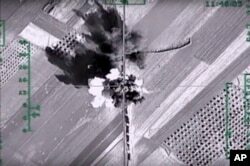 FILE - In this photo made from the footage taken from Russian Defense Ministry official web site on Feb. 1, 2016, an aerial image shows what it says is a column of heavy trucks carrying ammunition hit by a Russian air strike near Aleppo, Syria. David Evans, a spokesman for international aid group Mercy Corps, warned of a coming humanitarian disaster. "It feels like a siege of Aleppo is about to begin," he said. Most of the civilians heading for the border are not from the city but surrounding villages and towns caught up in the heavy fighting, according to activists. In a statement Friday, the United Nations' refugee agency said it estimated about 15,000 Syrians had left Aleppo due to attacks by Syrian government forces. The U.N. officials say Turkish authorities informed them that the border with Syria will remain closed for civilians, except for those who need medical attention in Turkish clinics. The civilians heading to the border must also dodge other players, including Islamic State, which has been exploiting the Assad offensive to resume bombardments of towns held by moderate and Islamist militias half an hour from the border crossing at Kilis, a Turkish border town. Syrian Kurds have also launched attacks on villages near the Kurdish enclave of Afrin. The Kurdish Peoples' Protection Units, or YPG, have been fighting non-Islamic State rebels and Jabhat al-Nusra along the border for weeks. Syrians who have managed to cross into Turkey, often by bribing Turkish border guards by paying $1,200 a person or paying people smugglers, say their journey was an ever-more-frightening trek with airstrikes following them from town to town. The Syrian Observatory said it documented the deaths of 21 civilians killed in Russian strikes in the last 24 hours. Other activist groups put the number of civilian deaths at 25. None of the estimates can be verified by VOA. Aleppo came under renewed airstrikes Friday, and there were reports of five civilians killed in raids on its al-Mashehad neighborhood. Two of them were children. In a statement issued Friday, the Syrian Coalition — the main Western-backed political opposition group — said, "Increasingly intensive Russian airstrikes are pushing tens of thousands of Syrians from northern rural Aleppo toward the Turkish border." The coalition said 2,000 families had fled from the towns of Anadan, Huraytan and Bayanoun. "The Assad regime and Russia's airstrikes have so far killed 436 civilians in Syria since the launch of the Geneva III Conference on January 29,” the coalition said. “The Syrian Network for Human Rights said it had documented 131 civilians killed by their full names over the past five days. According to the report issued Wednesday, 58 were killed in Aleppo due to Russian strikes, 24 in Deir Ezzor, 13 in Dara'a, 10 in each of Raqqa and Homs, and 8 in each of rural Damascus and Idlib." FILE - This Wednesday, Nov. 11, 2015, file photo released by the Syrian official news agency SANA, shows Syrian government troops walk inside the Kweiras air base, east of Aleppo, Syria. Speaking Thursday in London at the donors' conference, the Turkish prime minister said his heart was "with my country's border." "I am thinking of how and where we will need to locate the people coming from Syria," he said. Turkey is already hosting an estimated 2 million Syrian refugees. The Turkish government has increased security measures at the border. In Kilis, all scheduled leave for police and military officers has been canceled. This latest refugee flood is unlikely to slow in the coming days. The regime's offensive shows no signs of abating. A last-stand defense of the town mounted mainly by al Nusra, which this week sent nearly 800 fighters from the neighboring province of Idlib, failed to repel government forces Thursday, although rebel commanders say clashes are continuing to the west of the town. Rebel commanders are appealing to the United States for more assistance and to the international community to use any pressure it can to halt the Russian airstrikes. Zakaria Malahefji, political officer of the 3,000-strong Fastaqim Kama Umirt, a brigade aligned to the rebel alliance Jaish al-Mujahideen, or Army of Holy Warriors, told VOA a major humanitarian disaster is unfolding and that he found it ironic the United Nations is trying to resume peace talks at this time. "International negotiations in Geneva are talking about ending sieges across the country, but here at the same time Assad and Russia are aiming to besiege Aleppo," he said. 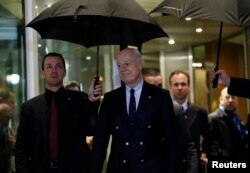 The United Nations Syria envoy, Staffan de Mistura, said he is trying to gauge whether there is international support, chiefly from the United States, Russia and Iran, for resuming the peace talks he had started this week in Geneva only to quickly halt the contentious gathering until February 25. De Mistura said he would resume the talks if there is a chance to make progress, but only if that is the case. "I repeat: I won't talk for the sake of talking, it's not acceptable," de Mistura said. "We negotiate in order to find an agreement." NATO chief Jens Stoltenberg says Russia's airstrikes in Syria are undermining efforts to find a non-military solution to the conflict. Stoltenberg made the comment Friday as he arrived in Amsterdam for a meeting of European Union defense ministers. He said the intense Russian airstrikes are causing increased tensions, as well as violations of NATO airspace and Turkish airspace. The Russian-backed assaults were in part responsible for derailing the Geneva peace talks, with Syrian government officials walking away from the talks after claiming that they had ended the rebel siege of two Shi'ite villages in Aleppo, handing Assad's government a major victory. VOA’s Ken Bredemeier contributed to this report.